This tutorial provides you with a foundation for working with Adobe Photoshop Elements still images. It is the first lesson in the Adobe Photoshop Elements 10 Digital Classroom book. Adobe Photoshop Elements can import video clips as well as photographs and other images. Although Photoshop Elements is not designed to do video editing, it can manage video clips either imported from some cameras, videos created using software such as Adobe Premiere Elements, or videos you obtained from friends and family. It can also take a single frame of a video clip and save it as a still image. Let’s see how Photoshop Elements can be used to do this. 1 Make sure that you’ve imported the Lessons folder, as discussed in the “Adding files and folders to the Organizer” section earlier in this lesson. 2 From the Organizer, choose View > Media Types and uncheck all options except for Video. This hides everything in the Organizer that is not a video file. You should see one file remaining in the Organizer, called Claire Bike Ride.avi. If you don’t see the file names, you may need to increase the thumbnail size to make the filename visible. If you still don’t see the filename, choose View > Show File Names. Hiding and showing media types makes it easy to see only certain media types with which you want to work. This is only one method of refining what you see in the Organizer. In the next lesson, you’ll see how applying keywords and tags to your media can streamline this process as well. 4 Choose File > Import > Frame from Video. The Frame From Video dialog box allows you to choose a video clip and grab still images. 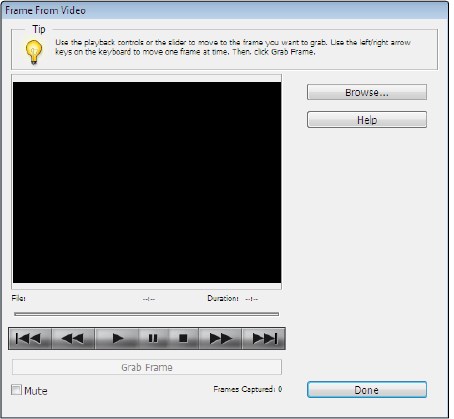 5 In the Frame From Video dialog box, press the Browse button, and navigate to the Lessons folder that you copied to your hard drive. Select the file named Claire Bike Ride.avi and press Open. 6 The video clip that you selected is displayed within the Frame From Video dialog box. Use the player controls below the video clip to play, pause, stop, go forward, and go backward in the video. When the desired clip is visible, press the Grab Frame button or press the Spacebar on your keyboard to grab a still frame of the video. You can grab as many frames as desired. Press the Grab Frame button or press the Spacebar on your keyboard while the video is playing to grab still frames from the video. 7 When you have grabbed the desired number of frames, press Done. 8 All your clips appear in the bin at the bottom of the Editor workspace. When you are finished, close each file from the bin by double-clicking on each file in the bin and pressing the Close button in the tab for each image in the main window of the Editor, or simply choose File > Close to close each image. You will be prompted to save files upon closing them. Save them to the Lessons folder making sure that the Include in the Elements Organizer checkbox is checked and that Photoshop is chosen in the Format drop-down menu. 9 Press the Organizer button ( ) in the menu bar at the top right of the workspace. You will probably only see the original video clip at this point because the other media types are still hidden. Choose View > Media Types and make sure there is a checkmark next to all the listed options. This ensures that you can see everything in the Organizer. All the images that you grabbed from the video clip should now be visible in the Organizer. If you can’t see all the images, choose View > Refresh or press F5 on your keyboard to force the Organizer to refresh the view of the images. Keep in mind that clips created from a video file contain a resolution sufficient only for on-screen viewing and probably will produce a poor image if printed on a printer or sent to a photo service. However, they should be of sufficient quality for slideshows and e-mails. Workspaces are different environments built into Photoshop Elements that allow you to perform different tasks on your pictures. Photoshop Elements utilizes two main workspaces: the Organizer and the Editor. Each workspace launches as its own individual application. 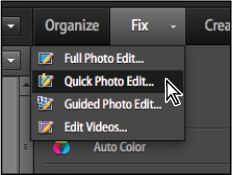 When you are in the Organizer workspace, which is the default workspace after importing images into Photoshop Elements, you can press the Fix tab in the upper right corner of the Organizer workspace and then press the Edit Photos button in the Task pane to launch the Editor workspace. Conversely, if you are in the Editor workspace, you can switch to the Organizer workspace by pressing the Organizer button ( ) in the menu bar at the top of the screen.